Forrest Aguirre is an American fantasy and horror author, and winner of the 2003 World Fantasy Award for his editing work on Leviathan 3. His fiction has been published in numerous genre periodicals and in the collection Fugue XXIX. His first novel is Swans Over the Moon. He often writes about Africa, and is deeply interested in the continent. I concur heartily with Mr. Zivkovic. Here is the conversation I had with Mr. Aguirre via the Internet. 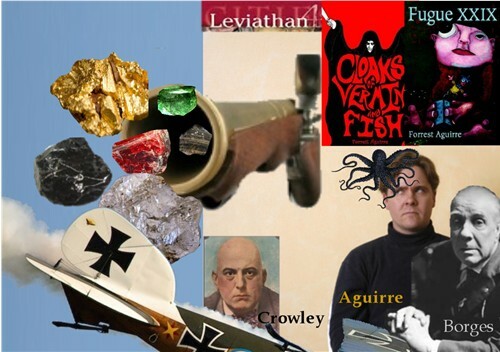 Bill Ectric: Occult practitioner Ogden Covent is a fictional character in one of the stories in Fugue XXIX, but you make him seem more real by first writing about Aleister Crowley. I created a character named Olsen Archer in my novel, Tamper, and hopefully made him seem more real by portraying him as a colleague of Richard Shaver. Why do you think we like to write “histories” of fictional characters? Forrest Aguirre: The master of the fictional history is Jorge Luis Borges, an author whose work I love to read. My academic background is in history, so that, of course, informs my writing quite a bit. The benefit of using a historical figure as an associate of your fictional character is twofold: First, many readers will have some familiarity with the historical figure that can be used to quickly immerse them into the setting. Second, and paradoxically, if the readers are familiar with the historical character, this allows the writer to play off of the readers’ preconceived notions in ways that contradict the associations the reader has formed in the past. This ploy simultaneously serves to associate and dissociate the reader from their preconceptions. Each of those results can be used to help the reader suspend disbelief, though they can also backfire if they’re either under-emphasized or over-emphasized. On one hand, you don’t want a historical figure to hijack your story and, on the other, you don’t want to contradict the historical figure to the point that it feels like a mockery (unless that’s your intent). It’s a bit of a tight-rope! BE: You write about Ogden Covent almost as though you are writing an essay. Would you consider that to be metafiction? FA: I enjoy work that spits in the face of genre conventions. I don’t know if “Mystic Flower” is necessarily metafictional, though it has the feel of a metafictional work. Much of my fiction is constructed as a series of documents that hint and infer, rather than construct a direct narrative stream. I’ve been accused of being light on plot in my short work, and I’m guilty as charged. My longer work is more plot heavy, but in short fiction, I like to strip down plot and let the reader fill in the gaps with their own imagination. Again, this goes back to my training as a historian. One goes to the primary documentation and works their way toward the history. It’s almost never as straightforward as some historians would have you believe. It’s a bit like building a court case, I suppose: you present evidence, paint the setting, and give meaningful character sketches. You emphasize some evidence and de-emphasize other parts, and push the jury to your desired decision. The reader has the final say in whether or not you”succeed,” since reading is a very individual experience, informed by the reader’s knowledge, training, and experiences. BE: Who are some of your writing influences? FA: I’ve been told I write like “Poe on acid.” Shakespeare is a big influence, as is H.P. Lovecraft. Thomas Ligotti is another writer whose style has had a heavy influence on my own. The Old Testament and Dante always seem to be floating around in the back of my head when I’m writing shorter work, as well. I love Italo Calvino’s work and can’t recommend it strongly enough. Rikki Ducornet and Brian Evenson are contemporary authors whose writing I greatly enjoy (and who are just great people, to boot). I read broadly, and I find inspiration in many writer’s works. If you go to Goodreads (or my blog) and look at my reviews, that might give you a good idea of writers whose work I like. BE: When Trent Walters interviewed you for the SF Site, you said your first drafts are always handwritten. Jeff Vandermeer told me he does that as well. Is there a particular reason for that? Do you use a pen or pencil? FA: I always use a pen. Which pen I use depends on the relative “speed” of the scene. I have a big, bulky glass pen (made by a glass-blowing stoner friend of mine) that I use when I need to write slowly. This one is particularly good for sections of dialogue where characters might be speaking particularly carefully, either to get a point across exactly or to guard against saying the wrong thing. Mostly, I use one of two wood pens. I like the heft in my hand, and I use heavier-gauge cartridges so that the ink flows quickly. Not the most economical of solutions, but it helps when I’m writing an action sequence or when I need to get through some quick, snappy dialogue. I’m a kinesthetic learner, primarily, so the physical act of writing helps me to process in a way that tapping a keyboard can’t. I like to draw (though I’m not particularly good at it), and writing and drawing have the same sort of “flow” from the hand, wrist, and arm. Handwriting is a sort of trigger, I suppose, for my creativity. Typing is for editing and revising, not for writing. Writing is immersive and involves the body, as well as the mind. Editing is best done clinically, from a distance. Keyboards are good for distancing one from the imagination. Your mileage may vary! BE: What do you think of the cut-up writing technique as used on occasion by William S. Burroughs? FA: I like it, as well as several techniques that the surrealists and dadaists championed, as writing exercises to get the imagination flowing. I don’t know that I could ever construct an entire piece of fiction using the technique, but it does get the brain charged up and knocked around a bit, which helps with creativity. BE: Have you read any Thomas Pynchon? FA: Mason & Dixon is one of my favorite books. I don’t know exactly why – so many things happen in that book and the characters are all so wacky and loveable that it’s hard to pin down the reasons for my love of it. I’ve never really analyzed it closely. Maybe that’s why I liked Mason & Dixon so much. It was just so much fun that I didn’t feel compelled to criticize it. And awaited the leveling of the weapon, the trigger pull, the shattering echo that heralds the final departure of its victim into the world of the dead. In the distance, propellers sliced into the world’s skin, wings plowed a field, flames consumed the earth-bound aircraft. Helmuth continued to fall. BE: Is Baelphoegele a real name for something? It makes me think of Baael, or Bael, the prince of hell, and also the baphomet, but I couldn’t find the actual term Baelphoegele anywhere. FA: I made up Baelphoegele. You’ve caught the essence of what I was looking for – something easily identifiable as devilish and evil. It might be a real name, but I’m no scholar of Middle-Eastern languages. Hopefully it’s not an Aramaic non-sequitur! Then again, that might be kind of fun: “Prince of hellish breakfast sausages” or something like that. BE: Are you saying Baelphoegele is Cassandra? FA: That’s up to the reader. Is Baelphoegele Cassandra, or merely Helmuth’s impressions of Cassandra? Or is it the set of circumstances that broke his heart? It’s not my call . . . the reader decides this. BE: I like the reference to beryl, onyx, ruby, and gold. These stones are mentioned early in the book of Genesis, which I always felt was odd, because, why, in the middle of describing Eden and the 4 rivers, did someone deem it important to throw in a fact about precious stones in the area? And these jewels seem to be connected to another word your story: mammon. Then I thought about the oil spattering in the airplane, and war being waged for oil and gold. FA: I like contrast. The idea of a man being killed by a devil (who might have been disguised as an angel?) with some of the most precious materials known, felt like a really striking image when it first popped into my head. Actually, the term “Grapeshot of Mammon” occurred to me first. I thought “what would Grapeshot of Mammon” be made of? So I fell back on Genesis (I believe these are also in the Revelation of John, but I’d have to look it up) for my source material. I honestly hadn’t thought about the oil and gold – that’s a nice inference. There was no auctorial intent there. Well done, reader! BE: Is the pilot thinking about Cassandra as he died, and we are seeing an impressionistic reverie in his mind? FA: I had hoped to tell the story of two planes of reality intersecting, one physical, one spiritual. Whether the spiritual plane is only in the pilot’s head or is some sort of superimposed reality is up to the reader. I’m not going to impose on the reader’s imagination! I like stories that leave the answers to these sort of questions up to the audience, answers that can change over time and after the reader has had more life experience. Some of my favorite stories and books are those that grow with you and that cause growth within you. BE: Do you think allusions to the Bible will slowly lose their meaning if fewer people are taught the Bible as children? For example, Faulkner’s novel Absolom, Absolom! was about a son rebelling against his father, and if my parents are any indication, there was a time when this allusion to the Absolom of the Old Testament was a powerful tool, connecting to their inner sense of awe. Or, when H. P. Lovecraft called something an “abomination,” back in the day, maybe this spoke to deeply rooted transcendental fears in some readers. Or maybe I’m wrong about less people being taught the Bible. I don’t have statistics. FA: The reading of the Bible is now becoming an academic challenge, more than anything. When children are taught the Bible now, it’s usually in a watered-down, child-friendly abridgment. So there seems to be a sort of split developing between academic readers of the Bible, on one hand, and those who know its basic stories, but don’t have an appreciation for the finer points of the writing itself, on the other. Knowledge of the Bible and its stories has become almost a barrier between intellectual classes, if you will. The intellectually “rich” use it for references that carry a great deal of power for those who have read the stories as translated in the King James or other, older versions, usually with little regard to the spiritual teachings it espouses; the intellectually “poor” use it for the moral teachings of the stories, with little appreciation for its inherent beauty as a work of art – in some ways it’s become almost kitsch, a series of cheap, popular morality plays. Whether or not you agree with the precepts or assumptions of the Bible, it is a beautiful piece of literature. I’m guessing that the Bible will never again be regarded as highly as it has in the past as both a work of beauty and as a utilitarian document. Your reference to Absalom is particularly poignant. I remember reading the story of David and Absalom around the time that my oldest son was going through some difficulties as a teenager. I read that story and actually cried thinking about the tragedy of David weeping aloud when he heard that his rebellious son had been killed by the king’s servant, Joab: “Oh my son, Absalom, my son, my son, Absalom! would God I had died for thee, O Absalom, my son, my son!” That’s powerful stuff, emotionally moving. The Bible is full of that sort of thing. Writers, no matter what their religious views, would do well to read through it and learn something from it, not only about potential allusions, but about the portrayal of the human condition. There’s writer’s gold in there! The same can be said for other religious texts, The Quran, the Vedic texts, and so forth. Though religion itself is on the wane, interest in our cultural heritage is on the rise. So, I don’t know, maybe the Bible and other religious texts will persevere, if not for their moral teachings, then as ancestral stories with wide appeal. BE: What about your novella? What ebooks do you have available through Smashwords? Archangel Morpheus – I love my brother, even though he drives me crazy sometimes. I imagined what lengths one might go to in order to find a sibling who had gone missing in action. Since I’ve found that grief often expresses itself in my haunted dreams, I thought it appropriate to force the main character to travel through the land of dream, on the borderland of death, in order to find his brother. It is a quest, but an extremely surreal quest, set between World War I and World War II. It’s funny you mention William S. Burroughs. He makes a cameo in Archangel Morpheus. “How?” you ask? “He was merely a child at that time”. Yes, but this is fiction, isn’t it? And surreal fiction, at that. And if you read the novella, maybe you’ll be able to figure out just how he got there and why. But really, Burroughs only serves as a minor character in the quest, though he does aid the hero in a couple of meaningful ways. Cloaks of Vermin and Fish – This is the first of three misadventures (the other two still to be published) of a pair of twins, both thieves living in Renaissance Venice. They are, in short, bungling idiots. One reviewer likened them to Abbott and Costello, and I suppose that’s a fair assessment. They have an entanglement with a certain fish-god worshiping cult that will be familiar to readers of early-20th-century horror literature. I had a fun time writing this novella. It was a lark, granted, and shamelessly indulgent. But, hey, it’s 99 cents – what’s not to like? Swans Over the Moon – This was initially published in trade paperback by Wheatland Press. Since Wheatland’s indefinite hiatus, I have re-edited the text and published it as an e-book. It follows the decline and fall of the Procellarian empire, an empire on a world strangely like Earth’s own moon if it had been populated by humans with a Victorian sense of fashion and a Machiavellian sense of rulership. Most of all, though, this is a story about family, loyalty, betrayal, and the tug of public obligation versus private relationships. In essence, I took Shakespeare’s King Lear and turned it on its head, killed it, then resurrected it in a new form. This seems to be the most popular of my e-book novellas. I also have a short collection of what I call “Object Fictions,” Fossiloctopus. There are 11 flash and very short fictions, in all, in this collection, each of them detailing or focusing on a physical object of some type. There’s the titular Fossiloctopus, bones from the Rwandan genocide, canopic jars, kaleidoscopes of Africa, a mirror surmounted with mechanical butterflies, the last key in Sodom, Nancy Davis’ bridal veil, and many other objects around which fictions have been built. There really is a little bit of something for everyone. I figured that by the time I had enough of these short object fictions to fill a book, I might be long dead, so I cheated death and published this little e-chapbook. I feel so naughty. This entry was posted in Uncategorized and tagged Aleister Crowley, Bible, Borges, Brian Evenson, Dante, fantasy, Forrest Aguirre, Fugue XXIX, historical fiction, history, horror, horror writers, Jorge Luis Borges, Mason & Dixon, Old Testament, Rikki Ducornet, Science Fiction, Swans Over the Moon, The SF Site, Thomas Ligotti, Thomas Pynchon, Zoran Zivkovic by Bill Ectric. Bookmark the permalink.